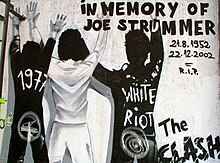 After the break-up, Strummer contacted Jones in an effort to reform the Clash. Jones, however, had already formed a new band, Big Audio Dynamite (B.A.D. ), that had released its debut late in 1985. The two did work together on their respective 1986 projects. Jones helped out with the two songs Strummer wrote and performed for the Sid and Nancysoundtrack. Strummer, in turn, cowrote a number of the tracks on the second B.A.D. album, No. 10, Upping St., which he also co-produced. With Jones committed to B.A.D., Strummer moved on to various solo projects and screen acting work. Simonon formed a band called Havana 3am. Headon recorded a solo album, before once again spiraling into drug abuse. Chimes drummed with a succession of different acts.